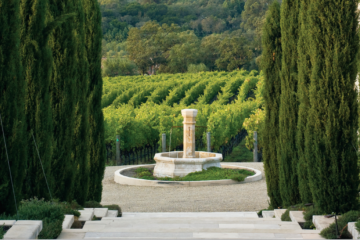 Shadybrook Estate Winery at Rapp Ranch, formally known as Chateau Lane Winery, was purchased in February 2016 by real estate developer and wine producing husband and wife team, David and Alice Alkosser. The 25 acre parcel came with 12 acres of planted vineyards, a state of the art production facility and a sprawling view of the magestic Coombsville hillsides. 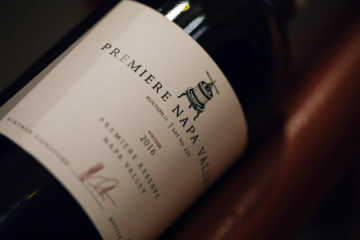 The acreage offered the Alkosser’s a unique opportunity to produce their award winning wines harvested from the Estate grapes from these vineyards and their 156 acre property in Popes Valley. The Chateau Lane property had an intriguing neighbor in Rapp Ranch, which was renowned in the 80’s and 90’s for its reputation in breeding and training quarter horses. The property contained barns, riding areas, and outdoor training corrals. 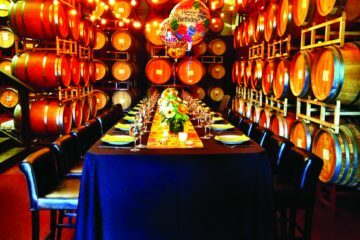 The Alkossers, enchanted by the history of the ranch, the premium vineyards, and state of the art winery, incorporated the unique hallmarks of each element and created a collection of distinct and memorable experiences. 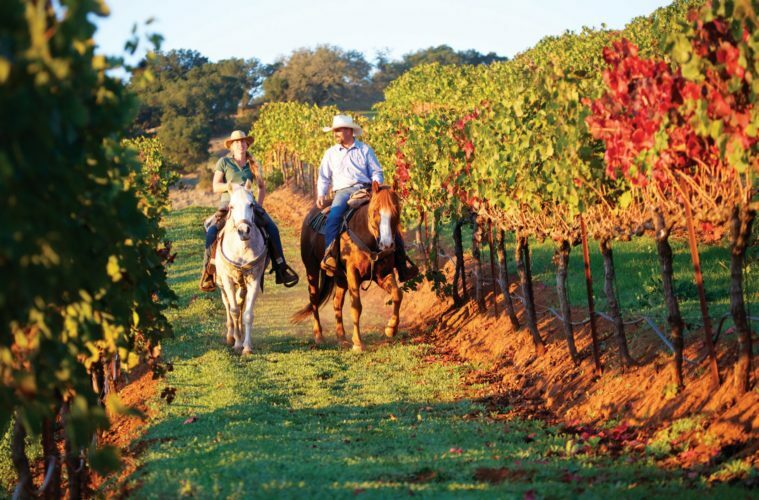 The Ultimate Ranch experience offers visitors a unique Napa winery adventure from a ranchers perspective…on horseback. Prospective riders are escorted to the stables to meet Cash, Whiskey, Silverado, Pancho, or Wizard, and fitted for boots, riding helmets and then saddled up for a 30 minute guided trail tour of the property. Some of the equines were rescued from stressful environments, and appreciate their new responsibilities as noble steeds. The trails through the vineyards offer riders magnificent views of the hillsides of Coombsville and Vacas Range. The tours conclude with a relaxed tasting seated on the 4000 sq foot terrace patio overlooking the vineyards and lavender gardens. 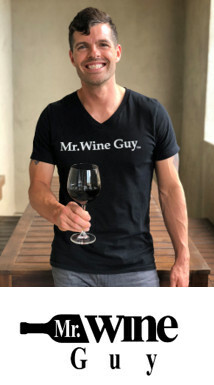 Guests are offered four estate wines produced under the winemaking mastery of Rudy Zuidema which include current releases of Shadybrook Estate and Rapp Ranch vintages. Selections may consist of Estate Cabernet Sauvignon and Cab blends, Pinot Noir, a Sauvignon Platine Blanc or Estate Chardonnay. Extensions of the Ultimate experience include a Romance theme, sunset tours, private tours of the winery, a chance to meet the winemaker, barrel sampling and a private view in the winemaker’s lounge. Forthcoming developments on the Ranch include the build out of the Olympic caliber equestrian center, boarding facilities and dressage training program. Tours and tastings last 60 minutes to 2 1/2 hours and are available by appointment. creator of their award winning “Double Lariat” Napa Valley Cabernet. 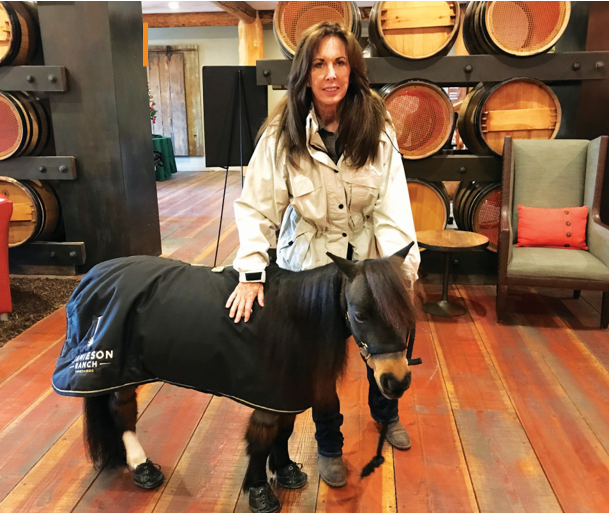 In addition to their jobs supporting those in need, Jamieson Ranch employs three of the “minis” (Molly, Sweet Jane, and Whinnie) into a family friendly tasting experience at the Ranch in an effort to raise funding for the Light House Foundation. 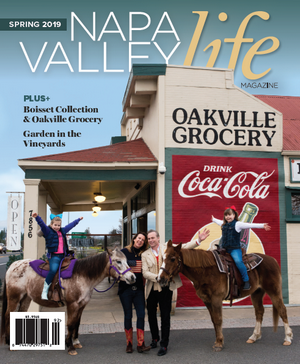 Appropriate for children and adults alike, this delightfulexperience offers participants the magical opportunity to interact with the adorable equines and learn from their trainer, Brandy Lipsey, about their history, their jobs as therapy animals and their lives as “employees” of the Light Horse Foundation. The 38” tall minis can be walked, hugged and petted and also love to pose for photos. Adults begin the experience with a chilled glass of Sauvignon Blanc or Chardonnay and conclude with a seated Signature Tasting of 5 of Jamieson Ranch Napa Valley wines. Sales Proceeds from the Light Horse Pinot Noir, Cabernet Sauvignon, and Chardonnay benefit the Light Horse Foundation. 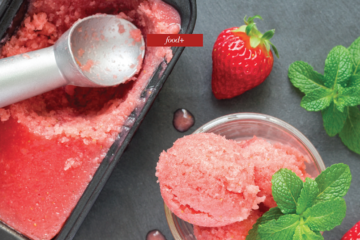 Tastings are offered at limited times and by appointment only. One child is complimentary per each adult tasting.